To encourage participation, our staff prepares a varied calendar of events full of stimulating activities. Crafts, cards, bingo, gardening, exercises, pet therapy, movie nights, word games, live entertainment, shopping trips, men's club, sensory stimulation, music and art therapy, and special theme dinners are just some of the activities available. We encourage active involvement in all programs, but residents may choose to participate or not as they see fit. 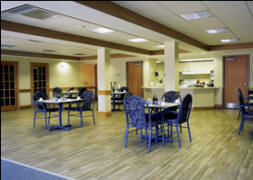 Our emphasis is on the self-direction and the dignity of each resident. In addition, residents are encouraged to remain involved with their family, their friends, and their community. Visits from members of local organizations, churches, school groups and choirs are popular events and foster a sense of connection with the community. Holiday parties and the opportunity for excursions to local events contribute to community spirit. Transportation and staff support is available for group outings. We believe that dining should be a pleasant experience for every resident - every single day. Meals are an important part our residents' lives. They encompass both a social and a nutritional element that is crucial to well-being. We pride ourselves in serving delicious home-style meals, prepared in our own kitchen, in the tradition of a country home. To ensure each resident's comfort and to promote social interaction, each of our "houses" has a pleasant dining area specifically for its own residents and their guests. We also offer a private dining area for family get-togethers and special occasions. Full meal service is provided three times each day, including a choice of entrées, vegetables, beverages and desserts. Alternate selections are also available. In addition, nutritious snacks and beverages are provided between meals and through the evening. Special therapeutic diets, such as diabetic and texture-modified diets, are provided as required. Understanding the importance of family involvement is part of what makes AON long-term care homes special places to live. We welcome family participation in every aspect of our residents' lives, from dining to activities to resident care. An open door policy invites family and friends to become a part of our community. We recognize, too, that a resident's family is also an integral part of our care commitment. Through family support groups, newsletters and a variety of information brochures and conferences we keep families informed. We encourage ongoing dialogue to ensure that all needs are being met. Each AON home has a lovely on-site chapel and offers a supportive program for those who wish to continue an active spiritual life. Residents may choose to go to a church service in their community or attend our weekly on-site chapel service, provided by local church leaders. In addition, our Spiritual Care Coordinator is available to assist in spiritual care discussions with you or your family. Celebration of religious holidays from all faiths is encouraged. Our attentive staff carries out regular housekeeping and maintenance duties to make sure that each resident's environment is clean, safe, and comfortable. Each room receives a light cleaning daily. A more thorough cleaning is done every week, or more frequently if required. A complete laundry service is provided by our staff right on the premises. Dry cleaning and mending services can also be arranged.